Two weeks into her freshman year of high school, Whitney began to have bad headaches, nausea, loss of appetite, and fatigue. Soon after, she found out they were caused by a medulloblastoma tumor. It was the size of a walnut and was located at the base of her brain, blocking spinal fluid from moving up and down her spinal cord. She had surgery to remove the tumor, followed by three chemotherapy/radiation treatments and nine maintenance chemotherapy treatments. With the help of research funded by The Morgan Adams Foundation, Dr. Nick Foreman of Children’s Hospital Colorado was able to adjust the treatment for high-risk medulloblastoma tumors, finding new hope for a previously incurable disease. After completing treatment, Whitney was valedictorian of her class, a Kansas Regent Scholar, and an inspirational speaker. It has been 11 years since Whitney was diagnosed with a medulloblastoma brain tumor on Labor Day in 2007. If you would have asked Whitney before the diagnosis what her life would look like now, she would not have imagined anything like it is, but she is so blessed to be living the life she is. 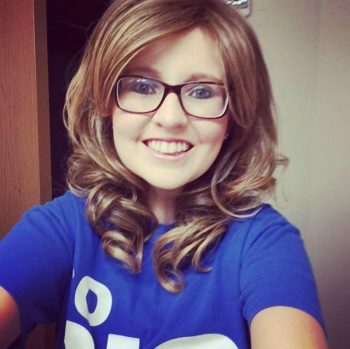 That diagnosis has molded and shaped Whitney into a strong young woman with an amazing spirit. Whitney graduated in May 2018 from Fort Hays State University in Hays, Kansas with a bachelor’s degree in General Studies and a minor in Business Administration with a concentration in Leadership Studies. She recently accepted a position as the Curriculum Secretary for Colby Public Schools in Colby, KS. MAF Impact: MicroArray Chip data has accurately identified a particular high risk medulloblastoma (c-myc positive). This has enabled us to adjust therapy and now means that children with this variant of medulloblastoma, previously incurable, now have a reasonable chance of cure.